The good people at Ark Group recently published a new book, "Compensation (Re)Design for Law Firms," edited by Soo Darcy. I was invited to contribute a chapter, entitled "Incentivizing the New Normal." As regular readers know, I believe that many, if not most, and quite possibly all law firm compensation plans are in need of an overhaul. There are numerous opportunities for improvement: aligning incentives with client needs; recognizing that different types of contributions deserve different rewards; eliminating the competition between furthering firm strategy and partner rewards; addressing the huge looming issue of succession planning and treating it as a firm wide problem, not as the responsibility of a handful of retiring partners to graciously solve by acting against their self-interest; and much more. Above all, incentivizing the new normal means rewarding profits derived from efficiency. The primary reason law firms don't embrace alternative fees or project management/process improvement is that these novel approaches, despite being demanded by clients, will erode partner compensation... but only if we stick with outdated compensation models. The list of other contributors to this book is impressive: August Aquila; David Baca; Thomas Berman; Jim Cotterman; Arthur Greene; John Jeffcock; Joel Rose; Julious Smith; and Mike Roster. If you don't these names, click on the links to their impressive credentials. They each offer different insights into the philosophy and mechanics of rewarding behavior for maximum organizational effectiveness. I am pleased to be among such esteemed company. If you serve in a law firm management or leadership role, do yourself, and your firm, a huge favor and purchase the book. Partner compensation has been considered by some to be the "third rail" of law firm management consulting. You can mess with anything else in this changing profession and industry, so long as you don't impact the partners' livelihoods. But here's the thing: the incentives as currently modeled in many plans are specifically designed to lead to the law firm's failure. The cost of doing nothing has never been greater. But lest the theme of "adapt or die" not be enough of an catalyst, think of it this way: your lawyers want to do the right thing for the clients; your clients want to continue to retain top lawyers; yet your compensation plan inevitably forces some unfortunate and awkward choices. 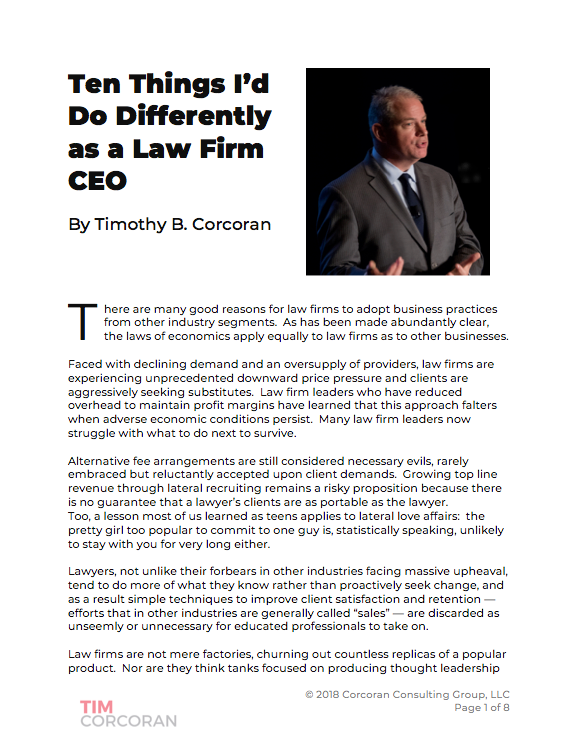 The lawyers have to choose between their own self-interest or their clients' needs; or the clients have to choose between excellent lawyers they know well but can no longer trust in lieu of unknown lawyers who demonstrably place client needs front and center. The law firms that figure this out have a window of opportunity to capture market share. When an organization's incentives are mis-aligned, and the highly compensated are rewarded for acting in ways that are contrary to the best interests of the firm, this is, undoubtedly, a bad situation and one can rightly assign some responsibility to bad actors. But the lion's share of the responsibility belongs to firm management. If you know the incentives are misaligned, and if you allow the perpetuation of highly-compensated individuals to pursue their own self-interest to the detriment of the organization, then you have utterly failed as a manager and a leader. There is nothing especially surprising about law firm incentives. Every other business on the planet has dealt with similar issues. Isn't it about time you step up?